Equitrekking Travel's Uruguay Beach & Coastal Trail Vacation is specially designed to let you experience an array of landscapes and culture across Uruguay. Uruguay is a country the size of England and Wales with a charming, warm population of only 3 million people. Uruguay is bordered by Brazil, Argentina and a long Atlantic coastline of beautiful beaches. The country has a non-tropical climate, unexpectedly diverse landscapes and gaucho culture. It's a little-known destination made for riding and enjoying nature. Mount strong Criollo or Criollo cross horses, a breed native to South America, and ride beaches and coastal trails. This is a progressive equestrian vacation. The length of each day's ride varies slightly between each group and day of the itinerary. Transfers from the airport are included in the price so there is no need to rent a car unless you decide to extend your trip before or after the beach and coastal trail vacation. Stay at charming seaside inns and working ranches, called estancias. Get connected with the traditions of this unexplored, genuine country, where South America's cowboy traditions still rein supreme. On this ride you'll travel through diverse landscapes, try surprising wines, good food and experience the hidden treasures found on paths less travelled in Uruguay. Escape North America's winters for long, warm days in Uruguay and in the saddle. Ride rolling hills, staying at a small working farm in outstanding countryside, where you may help the gauchos with cattle work and then ride to an estancia in an idyllic location on the edge of a lagoon. You'll explore the lagoon, marvelling at the wildlife and traversing an area of sand dunes to an isolated fishing village. Riders enjoy long gallops on pristine beaches and also riding through forests to a old Spanish fort. Excellent horses, comfortable lodgings, delicious food and incredible hospitality - including the ever helpful gauchos - all add together to make this an unforgettable experience. Bring along light weight layered clothes and riding gear. Uruguay has a warm, non-tropical climate, which is very pleasant riding. Saddlebags are provided. You will also need: Sun block, insects repellent, a warm coat, jacket or sweater, hat (sun/rain), footwear (boots or sneakers) bathing suit and wet weather gear for the eventuality of rainy days. Don’t forget to bring your camera and binoculars. Remember that as your bags will be transferred from accommodation to accommodation by car, you can pack as much clothes as you want to feel comfortable. There will normally be three changes of horses during the ride. As always one or more spare horses will accompany us. The horses are the local Uruguayan Criollo breed and criollo cross: ideally suited to the terrain. Criollo is the horse breed in Uruguay, Argentina and the south of Brazil. The breed was developed from horses that were brought from Spain in the 17th century and then breaded in this region. Criollo is a strong horse with an excellent walk and good character. We use local, ‘western’ type saddle with a sheep skin. Neck reining (western ‘one-hand riding). Help will be given in adjusting to this tack which is very suitable for long days in the saddle. This equestrian vacation lets you experience riding wetlands, virgin beaches, hills, and more. Each day is diverse. You may ride on the beach and then hours later feel as if your are in the middle of the desert surrounded by sand dunes that leads you to a sea lion reserve just next to the wild coast. Local guides will treat you as friends so that you will enjoy getting to know Uruguay. The variety of birds that you will see in these habitats is incredible from hummingbirds to flamingos, kingfishers, flycatchers, and rheas (similar to ostriches). You'll skirt diverse landscapes and try local wines and cuisine along the journey. Ask us about options for non-riders. There are many! 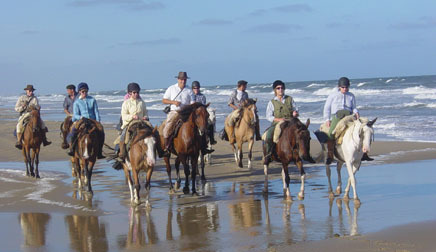 The accommodations provided in this program include charming seaside hotels and ranches available in the areas we visit. They are clean, comfortable and provide a good service. You will be able to get good night’s sleep in pleasant surroundings. If you are sharing your room, please let us know in advance if you prefer twin or double beds. After a full day riding, it is comforting to know that you can return to fully prepared meals that reflect the local cuisine. All meals are prepared with completely natural and fresh products of the region. Red meat, fish and wine are specially recommended, but we can easily cater for vegetarians with advanced notice. Intermediate to advanced riders who want to experience South America on horseback and ride on the beach. Couples, families and many solo travelers enjoy this vacation. Singles particularly enjoy the experience as it is a great opportunity to make new friends and share life stories. Ride through stunning coastal scenery in Uruguay, a lesser visited gem in South America with welcoming people and beautiful beaches. The Uruguay riding holiday takes place in Rocha and crosses the Banados del Este Biosphere reserve, a UNESCO site. Explore diverse wetlands, sandy and rocky beaches, hills, native forest, palm groves, rivers, coastal lagoons and savannahs. There are more than 400 species of birds in this area, so you'll likely see a variety on your riding vacation. Spend nights in hotels, lodges and ranches and meet the locals on your riding vacation in Uruguay. Single Supplement $540 this will be refunded if we find you a sharer. ￼￼￼￼￼￼Small Group Supplement: A surcharge of $800 USD* per person (accommodated in DBL room) will be applied to small groups up to 3 people. Ask about other available dates for private groups. We ride from October to December and from late February to April! All accommodations; all meals and mineral water (except 1 day); English speaking guide; 7 riding days; horses and grooms services & 7 nights (Private Bathrooms); transfers and tours as per itinerary. International flights to Montevideo. Soft and alcoholic drinks; personal expenses & tips. Non Riding Options: Sight-seeing; hiking; fishing; surfing; biking; trekking; canoeing; bird watching. We start our tour in the capital city of Montevideo. The next day we drive to the amazing coastal province of 'Rocha' - protected area and declared world biosphere reserve – where we arrive to a small hotel built in the same style as the nearby 17th century fort; we are right on the border with Brazil. We ride along isolated beaches, over shifting sand dunes, through palm groves and shady woodlands, in National Parks and on along the shores of the wetlands. The variety of birds - hummingbirds, flamingos, kingfishers, flycatchers, rheas (similar to ostriches) - that we see in these habitats is incredible. The pace will be quite fast (with lots of canters) - the grassy pastures and firm beaches allow this on strong and well- trained criollo and criollo cross horses. We will stay at charming seaside inns and working ranches – estancias – where we ride with and help the gauchos with cattle drives. You will be able to feel connected with the traditions of this unexplored country and skirt the most diverse landscapes, surprising wines, excellent food and experience the hidden treasures found on the paths less travelled. After breakfast, we will be driven to the Brazilian border and into Rocha, arguably the most beautiful province in Uruguay with pristine beaches, emerald shores and a great network of lagoons. We will arrive to Estancia “La Rosada” located next to the small town of La Coronilla. After lunch, enjoy a wonderful ride along the estancia in order to get to know our horses. After a typical “merienda”, continue onto Fortin de San Miguel, built in the same stone as the nearby Portuguese fortress. We can admire the views out across an enormous stretch of fresh water - one of the largest fresh water reserves of South America, the "Merín Lagoon"; we are right on the Brazilian border. This area is home to a wide variety of birds and we will see many different native trees and bushes. Dinner and accommodation at “Fortín de San Miguel" Hotel. AB, L, D.
After a picnic lunch, riders may have a pleasant “siesta” discovering that gauchos’ saddles are so comfortable to ride as to sleep! In the afternoon, we will enjoy a fast-pace ride along the wonderful, isolated ocean beach of ‘Barra Chuy’. Visitors seldom reach this beach so we can enjoy a long, exhilarating canter with no signs of habitation as we ride across the pure white sands alongside the Atlantic Ocean. We arrive 22km (12 miles) further south to "La Coronilla" and stay at small beachside hotel. AB, L, D.
Today we will ride south alternating beaches, sand dunes, pine forests and coastal hills where we might see dolphins feeding before getting to the immense Santa Teresa National Park. The center piece of the park is a fort started in 1762 by the Portuguese to defend the edge of their territories then completed by the Spaniards who took it by assault just a year later. This was just the start of a succession of conquering, losing and reconquering the fort; it was not until 1825 that the newly forming ‘Uruguay’ finally captured and held the fort. The fort is surrounded by 3000 hectares of forest containing over 2 million trees, most from other parts of the world. After a picnic lunch we will enjoy riding along the forest trails and down to the beach and we will pass a shipwreck buried in the sand, one of many along this treacherous coast; indeed, Cabo Polonio (where we ride later) is named after a Spanish galleon that went down just off the point. Luckily ‘Beagle’ with Charles Darwin aboard did not succumb to this fate and Darwin spent quite some time in Uruguay collecting species and most likely starting to formulate his theories of evolution. After a traditional picnic close to the fortress or on the beach, depending on the weather, we will continue along the coast towards the lovely town of Punta del Diablo. Dinner and accommodation at Posada Terrazas de la Viuda. AB, L, D.
Morning ride along the estancia ́s fields. We will have the chance to work alongside the gauchos and their trusty dogs as they tend to the cattle and sheep on this working ranch. The work varies depending on the time of the year, but the gauchos always welcome a bit of help checking and moving the stock or putting animals in the corrals. Sometimes a lame animal has to be caught and tended to. The wonderful, friendly gauchos with their berets and their knives tucked into their colorful belts all seem to have been born on a horse and it is a delight to be riding with them. We will enjoy lunch at the neighbour estancia Barra Grande where we will enjoy lunch and a tyipical ̈Uruguayan merienda ̈. We will then ride back to Guardia del Monte. Dinner and accommodation. B, L, D.
Liz and I had the most wonderful time on your ride. We have taken over a dozen different week-long rides in all corners of the world and we thought yours was by far the best. The horses are fabulous - responsive, well-trained, bomb-proof. We could all gallop in a random fashion with never a kick, bite, or laid-back ear. The gauchos seemed to know exactly what help you needed, even though they spoke no English. But the guide, Juan Pablo, was the main reason this was our best ride ever. He was serious about safety but his top priority was that we all had fun. He kept emphasizing that it was our vacation and we should do what we want. This was not easy with nine different women with nine different agendas, but he made it happen. My horse was responsive, fast and as you probably guessed, I had enormous fun riding her. The scenery, whilst not dramatic, was tranquil and gave a great sense of space with the coastal sections being particularly enjoyable. The accommodations were comfortable and special mention must be made of our numerous hosts for their kindness and warm hospitality. I would also like to pass on my sincere thanks to Alejandro and Paola and his team for their hard work. The organization as a whole was impressive and, if you were all paddling away like fury beneath the water, everything seemed pretty serene on the surface to me! Thank-you for a fabulous holiday. Uruguay is a gentle country with vast, open skies and beaches, humorous people and lively, eager horses. Each day was varied, enormously fun, the estancias were all idyllic and their owners charming and welcoming. Once more a big thank you for the excellent tour. Pictures look excellent. We hope to see you all in October in Belgium for the after-party. We loved our holiday and all of us said that it was the best with the most amount of laughs! We certainly will recommend Uruguay to friends and would love to come back. Thanks again for looking after us so well. We had such a great time. We had a wonderful ride, and enjoyed your country and the people we met VERY much! We enjoyed Macarena, and all her insights into that area of Uruguay where she was from, and Nacho is a real natural at this kind of work. The picnics were lovely and well planned, the horses were fine, and the gauchos did their jobs well. We also enjoyed all the different places that we stayed. The group was friendly and fun, and as riders, everyone was strong and capable, which always helps. Country of Uruguay: awesome, beautiful, calming and uncomplicated - suited me very well and I hope to return one day. Gauchos: experienced, professional, good at horsemanship and navigating the terrain - enjoyed them very much and felt that they took excellent care of the group and the horses. Guides: Nacho and Macarena along with our bus driver were wonderful knowledgeable (about the country, history, sites, etc. ), fun, good riders and great company. I would send anyone to you and know they would be in good hands. Estancias: very charming, comfortable and welcoming - I liked going from place to place and each one was special in its own way. Food: very good, fresh, local choices all very much enjoyed. Loved the wines. Horse: very good. Even though I got unseated and took an early spill, I felt very comfortable with the horses. I found them to be well trained, very willing, very responsive and possessing even/good temperaments. I really thought you and the gauchos did a nice job of matching horses and riders. Rides: very nice, varied and fun - my only suggestion here would be to describe the ride as intermediate + with a moderate pace (mix of fast and slow with some less intense days to give horses and riders a break). I know the slower days were not as well received as the faster days or as the days which provided for a mix of fast and slow gaits. It was a super, super trip which I thouroughly enjoyed. The organisation was perfect all the way through. Special thanks to you, Macca and the guide from Montevideo (he was very, very committed, but I cannot remember his name, sorry..). And a big thanks to our enthousiastic and very kind busdriver and to the gauchos who accompanied us most of the way. They were so well organised, it was astonishing! Thank you again to Nacho and Alexandro for introducing us to your wonderful country. I know we will return. Thank you, thank you to all for making my vacation so brilliant!! I would love to see your photos! Look forward to hearing from you all, and best wishes to those lucky enough to still be enjoying the South American hospitality & weather. Just a quick email to thank you very much for a great visit to Uruguay. It was a pleasure to meet you and we very much enjoyed our holiday. The horses were always excellent as was the accommodation, and Jan and yourself were good company. You know you’ve found a hidden gem when there aren’t even guidebooks available for the country when you travel there! Uruguay is a small, charming country with a still vibrant gaucho culture, great food and welcoming people. I felt like I was getting a genuine estancia experience in Uruguay and am excited to go back and ride again. -- From Equitrekking Travel founder and Emmy winning host Darley Newman. The first ever Lonely Planet guidebook was stapled together at a kitchen table. We're keeping that spirit alive with CUSTOM guides - sections of our most popular books combined to fit your trip. Uruguay is delightfully low-key and surprisingly diverse, but you won’t find a guidebook for it - until now. This custom guide, made up of chapters selected from Lonely Planet's Argentina guidebook, covers Uruguay, including cosmopolitan Montevideo and the wilder outer reaches. We've also included buzzing Buenos Aires because, let's face it, you're in the area already – why not take in the Buenos Aires blend of old-world languor and contemporary attitude? Sound like your kind of thing? Then this is the CUSTOM guide for you. This book includes: Maps and detailed information to help you explore every corner of Uruguay. Chunky coverage of Buenos Aires: where to stay, where to eat, what to see. A language chapter that covers all the essential travel phrases in Argentine Spanish. Health information including recommended vaccines. *If you are over the weight limit, please contact us for additional information.